South Korea’s largest telecommunications firm, KT Corp., said Monday it would commercialize the world’s fastest mobile network, called the GiGA LTE, which combines the current Long Term Evolution networks with Wi-Fi connections. The new network service offers a maximum download speed of 1.17 Gbps --15 times faster than the existing LTE and four times faster than the tri-band LTE-Advanced, the fastest wireless network currently available in the Korean market. It also boasts an upload speed 10 times faster than that of the tri-band broadband LTE-A. The GiGA LTE is expected to help the mobile carrier to gain a competitive edge in the race to bring the 5G network first to the Korean market, accelerating technological advances in the mobile industry. 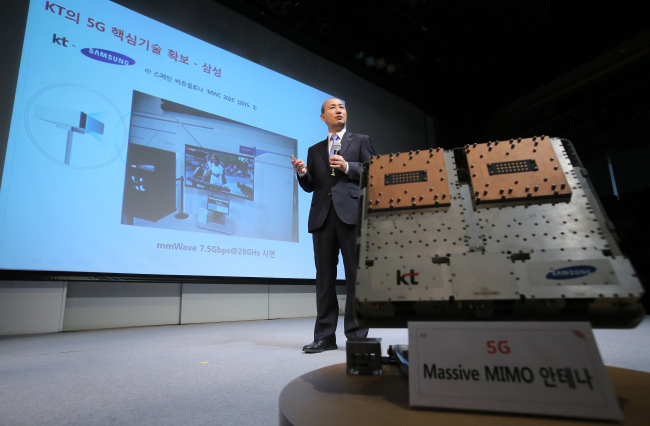 “The GiGA LTE is a high-end technology that is two or three years ahead of its time,” said Oh Sung-mok, head of KT’s network division, at a press meeting in Seoul. “KT will spare no efforts to develop faster and more stable mobile technologies for customers,” he added. The wireless carrier, which has 200,000 LTE base stations and 140,000 Wi-Fi hotspots installed across the nation, also plans to increase the coverage of the GiGA LTE services down the road to accommodate increasing data traffic. Mobile data traffic will increase up to 1,000 times by 2020 when the 5G networks are anticipated to be deployed in earnest and futuristic technologies such as 8K video content and UHD hologram services will become commonplace, according to KT. KT said it had collaborated with smartphone-maker Samsung Electronics for the past nine months to develop the GiGA LTE technology. With firmware updates to be available from Tuesday, users of Samsung’s Galaxy S6 and S6 Edge will be able to use the faster LTE services, according to a KT official. “Around five to six more high-end and mid-end Samsung handsets, compatible with the GiGA LTE, will be released in the latter half of this year along with some LG Electronics handsets,” the KT official said. The commercialization of the GiGA LTE services came after KT chairman Hang Chang-gyu announced in May last year that the company would establish the top-notch wired and mobile GiGA communications infrastructure. Not to be outdone, South Korea’s largest mobile carrier SK Telecom and LG Uplus also announced on the same day they would commercialize mobile network technologies this month that aggregate LTE and Wi-Fi networks to offer faster mobile services.